Since our son doesn't tolerate milk very well (not even raw milk - more on that some other time), we've experimented with a variety of dairy free milk alternatives. We've tried almond milk, hemp milk, rice milk, and even flax milk. For one reason or another, we've foregone each of those after a while. More on that later as well, but suffice to say that we've landed on coconut milk due to the winning combo of taste, nutrition and digestibility. Coconut milk is rich in vitamins C, E, B1, B3, B5, and B6 as well as iron, selenium, sodium, calcium, magnesium and phosphorus. It contains a fatty acid called lauric acid, which has many benefits including anti-bacterial and anti-fungal properties. Not to be forgotten, it also contains a small amount of fiber, unlike milks made from other nuts/grains that have a much lower fiber content than coconut. So, there are some things that I buy instead of make because I am fine with whatever compromise is represented (whether it's an ingredient or something else). There are other things that I buy because I DON'T HAVE AN EXTRA 17 HOURS IN MY DAY LIKE A HOBO (sorry, is that PC?). I make my own coconut milk because it doesn't fall into either of those above-mentioned categories. I cannot find a brand of coconut milk that I am truly satisfied with, and since my son consumes quite a bit of it, it's important to me. Also, it's extremely easy and quick to make! Really. And unlike so many things that require some level of culinary savvy despite all the promises of effortless DIY glory, you really cannot screw this one up. 1) Take the coconut chips (shredded coconut works fine as well) and place them in the blender. 2) Get the water hot - close to scalding but not quite (this is important). Pour the water over the coconut chips. I use about 3.5 cups of water - the amount you use will change the consistency and thickness. If you want a thicker milk, use less water, and vice versa. I've played around with the amount of water and there isn't a huge difference, but if you use too much it will be watery and have less flavor. No deal, amiright? 3) Blend on high for 3-5 minutes depending on your unit and it's power. You want it to be completely mixed, hot and frothy. Don't worry that there are grainy chunks of coconut, you're going to strain them out. 4) Now, let the mixture "steep" for 10-15 minutes. This depends on how many minutes and screaming children you have. But really, do this after they go to bed so it's fresh in the morning, unless they are light sleepers and your blender is really loud in which case don't. 5) Throw in the dates and vanilla extract and blend for another minute or so until dates are well mixed in. You could definitely use a different sweetener here, like local honey, maple syrup, or stevia drops. I use dates because they are delicious and the flavor pairs perfectly with coconut, and the idea to use them as a sweetener in milk came from a local Oakland company called The Living Apothecary, whose delicious products I found at our local farmers market (super spendy at $7 for 13 oz. Ouch!) The amount of vanilla that you use is purely up to you based on your tastes. 6) This is starting to sound like a lot of steps but it isn't. Now, you're just going to strain the milk into a bowl/etc. 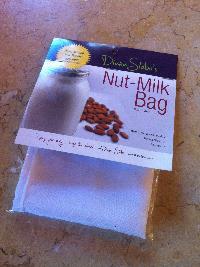 I use a nut milk bag like this one pictured, but you can easily use cheesecloth or even a really fine mesh strainer. Let the milk drain well and then squeeze the bag or cloth to make sure you get all of the precious liquid out. And that's it! It's really just blend, strain and chill. And consume. A friend asked me to share about the creaminess of this milk - and it's important to note that this is really a "drinking" milk - it's not super thick like coconut "cream" that one would buy in a can. However, it is still quite creamy, and there is usually a little separation of cream that solidifies around the top. To avoid too much separation, make sure your water is hot enough while mixing, and allow to cool at room temperature before chilling. Now, back to the reason why I'm making coconut milk in the first place - it's hard to find a good commercial brand. Most of these brands contain carageenan, a variety of gums (like xanthan gum, gellan gum, and guar gum), and other unnecessary additives. Carageenan, in particular, has been linked to gastrointestinal disease and cancer, and many of these additives can be hard on the digestive system. There is only one commercial brand of coconut milk I have found that is satisfactory, and it is Native Forest. It comes in a BPA-free can, is organic and the ONLY additive is guar gum. While guar gum can still be problematic for some, for the majority of people this is a good option, and definitely the best commercial one. It still isn't as delicious or cost-effective as making your own - but my goal on Guilt Free Mama is to provide options, since we all have different goals, interests and amounts of time. Good luck and share how the recipe works for you!